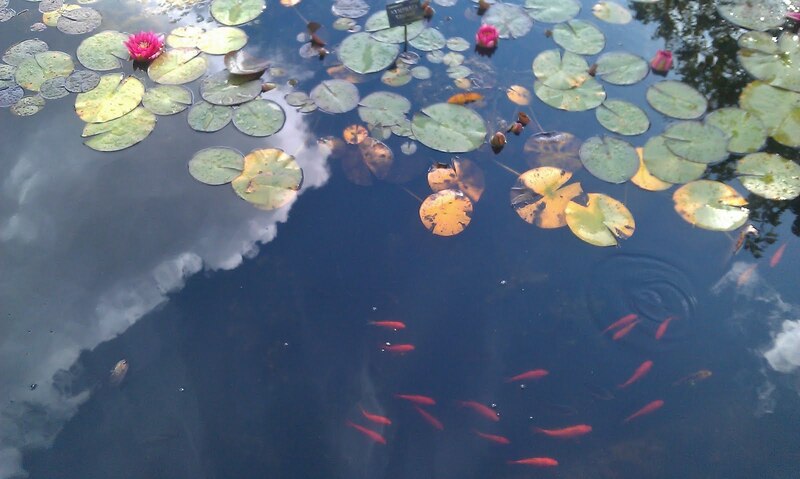 This lovely photograph of fish in a pond with lily pads and reflections of clouds in the sky above was sent to me the same person who sent the pictures of the mandrake and dahlia that I posted earlier in the week. Sit comfortably. Close your eyes and take three slow, deep breaths. Imagine that you are sitting beside a pond in a beautiful, peaceful garden. It is a warm day, the sun is shining and the sky is blue with just the occasional little white fluffy cloud. Around you flowers are blooming, filling the garden with a wonderful perfume. The grass is green and soft. Only the sounds of birds song can be heard. You look at the pond. There are huge water lilies on its surface and the sunlight sparkles on the water. You feel relaxed and happy to be there. Spend a little while enjoying being in the beautiful garden beside the pond. After a while, a little cloud drifts in front of the sun, throwing a shadow over the garden. It feels suddenly a bit cooler and sunlight no longer sparkles on the surface of the water in the pond. For a moment, this disturbs you. You think to yourself, why can't it always stay so warm and sunny? Then you notice that without the light reflecting off the pond, you are able to see more clearly below the surface of the water. You realise the pond is quite deep and although the bottom is lost darkness, the water towards the top is clear even if tinged with green. You can see fronds of bright pondweed and water lily stalks stretching down into its depths. Peering into the water of the pond, you glimpse a dark shape moving somewhere far below the surface. It is a fish; a huge mottled mottled silver-grey carp. As you watch, you see another, then another. You realise that the pond is home to a shoal of lovely sleek carp. This is their home - it is peaceful and cool and they are happy to live there. Some seem to be at rest, only moving their gills as they take their oxygen from the water. Others swim about in a slow and graceful dance around each other. You are fascinated to get this glimpse into their watery world, so different from the land above that you live in. Then, you notice one carp that is golden in colour, yet it swims in harmony with its grey-silver cousins. Spend a little while watching the shoal of carp in the depths of the pond. After a while, you begin to think that the golden carp has become aware of you. It seems to be watching you, as you are watching it. It rests for a moment, then slowly starts to swim upwards, towards the surface of the water, as though it wants to get a closer look at the human who is peering in from outside the pond. As it gets close to the surface of the water, your eyes meet. There is an odd sense of understanding suddenly between you and the golden fish. You feel that it has a message for you; a secret it wants to tell you and that you want to hear. You bend down close to the surface of the water, just as the fish rises up to just below the surface. Then, just for a moment, the face of the golden carp breaks through the surface with a gentle splosh and a ring of little bubbles. And, just maybe, you got the message it was trying to impart - perhaps in words, perhaps in images, perhaps just in your mind. The golden carp swims back down to the bottom of the pond to join its silver-grey cousins and you sit back up, beside the pond. At that moment, the sun comes out from the other side of the cloud, its rays of light flooding the garden with warmth once more and sunlight sparking from the surface of the pond. Shortly you will return to your normal world, but for a little while longer stay in the garden and enjoy its beauty while pondering on the message from the golden carp. When you are ready, open your eyes and stretch your limbs before standing up. The picture is copyright the photographer. Do not copy it or download it without permission.